Scott Armstrong (CSP) is an international speaker, emcee, published author and is recognized by his colleagues as an extraordinary visionary leader who has the uncanny knack of motivating others to inspired action. Sitting at a office desk over 20 years ago, he was deeply frustrated and knew there had to be more than pushing paper. He made the choice to go Limitless. Three years later Scott had created Canada’s largest rehabilitation centre for abandoned exotic animals –swimming with jaguars, running with wolves, playing in the snow with tigers. How does swimming with tigers launch a 25-year speaking career? Well when you also inspire over 2000 businesses along the way then there is something special to talk about. Starting an exotic wildlife sanctuary from scratch and growing it into one of Canada’s premier environmental education centers without a single donation requires a special talent. Growing that talent and becoming Director of Entrepreneurship and Corporate Training at The British Columbia Institute of Technology requires exceptional future vision and relentless tenacity to provide sustained motivation to a diversity of audiences. In addition, he educated over 20,000 children on endangered species and was privileged to provide ‘Make A Wish’ dreams come true for dozens of terminally ill children and adults. Scott has since spent his time showing thousands, including military personnel and professional athletes, how they can make their Limitless dreams come true. Whether as a University Professor or Director of Corporate Training at BCIT Scott has helped over 3000 individuals create their own businesses and over 2000 employees engage their next level of high performance. Specializing in business and personal motivation for growth Scott brings a counter intuitive energy to his presentations, helping clients broaden their perspectives to otherwise concealed opportunities. He possesses a remarkable ability to understand what is truly important to his audiences. A gift to you! One life-altering juicy goal – realized. What would yours be? In your most pumped-up state, what do you think is possible? What if your dreams, no matter how incredible, are only the entry point to a new life of passion and fulfillment! Why, you ask? Quite simply when you are living life with meaningful energy you attract others who are also doing extraordinary things. When this happens unbelievable opportunities…well, they just begin to appear. Hobble procrastination so you will see and feel results immediately. The spirit of disruptive innovation is essential for all successful organizations – large or small. Don’t agree? Just look at how resource companies are struggling to cope with $30 oil, or retailers 3 steps behind Amazon’s expansion to 50% of the market. Birthing and nurturing an innovative mindset and company culture that dreams of, creates and executes disruptive innovation is no longer the unique calling card of superstar brands like Apple – it is essential to any firm looking to succeed beyond the next calendar year. Break the numbness of debilitating routine and move to innovative and proactive thinking, every day. Is it passion? A sound business model? A sustainable market? After helping over 2000 businesses launch and grow over the past 15 years Scott has deeply learned that every successful business owner’s success is…well, unique. Ask him – he developed Canada’s largest exotic wildlife refuge and spent his working days playing with wolves and rehabilitating tigers. A published entrepreneurial author, Scott will share his top 20 tips to effectively motivate, inspire and coach entrepreneurs from all walks of life. Transformational, and inspiring are what audiences consistently call Scott’s keynote. Your conference organizers will thank you. Habitudes –a word not heard very often but one that is the core of every action, success or failure, taken. In short, we become what we think. The perspective, the framing that you wrap around a circumstance is the key determinant in what happiness, indifference, success or pain you will experience. Habitudes, the partnering of our attitudes and habits, generates the experiences and results we get in all aspects of our lives. And the incredibly empowering fact is we can choose what we want! Imagine the differences experienced if our initial thoughts looked for opportunities, not deficits; innovation instead of routine; efficiency not confusion. High Performance Habitudes provide incredible life-long benefits to your career, finances, health and relationships. Getting a connection with and understanding the needs and desires of people you work with is not the sole domain of professional salespeople. Everyone needs these skills whether you are selling to a client, applying for a job or trying to get your boss to say yes to your idea. This presentation is chalk full of need to know, how to use techniques that will provide you with immediate results. After losing his wife, Wil is looking for a fresh start with his daughter in the remote west coast town of Prince Sound. But TRUE COST, a mobile computer app he creates to help his daughter at school gives him anything but. Steph is a chemical engineer and heads a multi million dollar firm in Toronto, specializing in fracking in the oil patch. The unexpected death of her only brother gives her something she never wanted – a child to care for and a challenge to her values. Wil and Steph’s geographical and ideological chasms begin to evaporate as they are plunged into a the most powerful game of corporate espionage the world has ever seen. 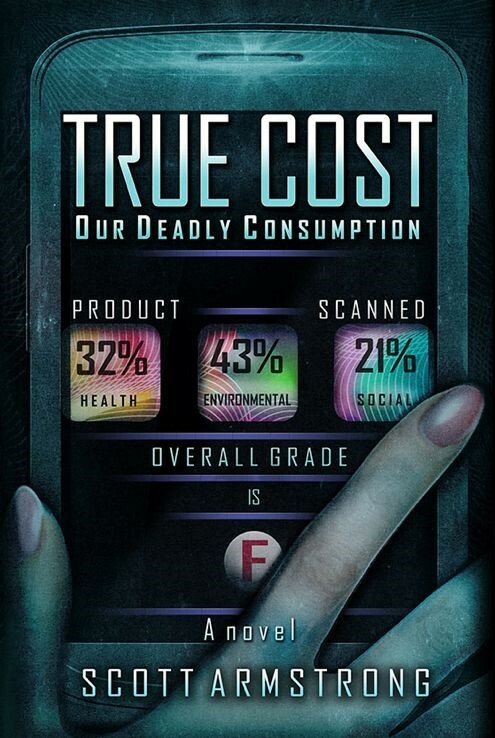 TRUE COST is a blessing and an apocalypse. It evaluates products world wide on health, labour and environmental criteria, and goes unexpectedly viral. Soon Prince Sound, and then the world, are changing what they purchase, and what they don’t. Such a shift creates a tsunami of attention, as well as powerful enemies who are losing billions of dollars. Wil and Steph, his new venture capital partner, are hunted by the clandestine and all reaching arms of the corporate underworld who will stop at nothing to take TRUE COST offline, permanently. From China to Toronto, New York to Costa Rica, Wil and Steph try and evade the hidden assassins as they attempt and get the next version of TRUE COST up and running. Save the world or save themselves? It is a choice they need to make at every turn. Steph’s character is one of survival and success in a male dominated industry. She is as tough as it comes until that moment that touches her in a place she promised she would keep buried forever. Scott’s energy and commitment resonate through the delivery of his highly effective motivational presentations and workshops, ensuring that his audiences take away new insights, skills, inspiration and momentum. We have worked with Scott on a couple of live TV / Webinar projects in the past few months. Scott has a dynamic personality that is energizing and confident. We love working on the stage with Scott as it raises our game every time! Robert Murray, President, CompassPeak Inc.
Scott is a fantastic speaker with a great sense of humour and a profound understanding of business. His knowledge of business strategies is second to none and I’ve watched him energize hardened veterans and entrepreneurs alike. Book Scott while you can – your business will thank you for it.